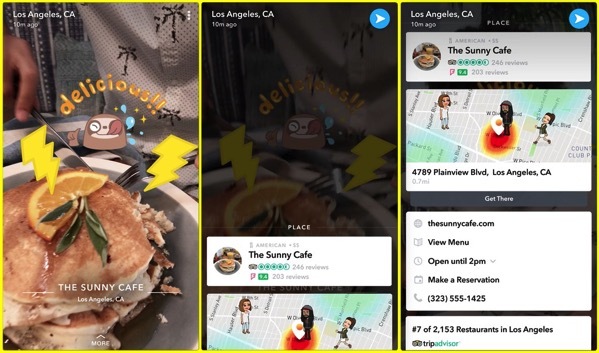 Snapchat has today announced the launch of new content discovery tool called ‘Context Cards’, which allows users to swipe up on some Snaps to find out more information, as well as connect to other services such as Lyft or OpenTable. Snapchat founder Evan Spiegel told Wired in an interview that by adding words and information to images, they want Snap’s users to act on what they see by discovering directly through images. Spiegel says that Context Cards will change the way we discover new information. He explained that people currently find stuff on the internet by typing queries into search boxes and following hyperlinks to the content. Consider a YouTube video. “You upload the video, and you tag it with a bunch of text,” says Spiegel. “If you want to go find that video again, you type in the text and it surfaces the video.” In other words, the text directs you to video. With Context Cards, Spiegel highlighted that users will instead begin with images and video that will direct them to text, and more images and video. Whether Context Cards qualify as an innovation or not, remains a big question, since many social services already invite users to click on images to discover more information, from Instagram and Google Maps to Pinterest.